AOR cult hero Stan Bush returns with an album that he calls "The Ultimate". 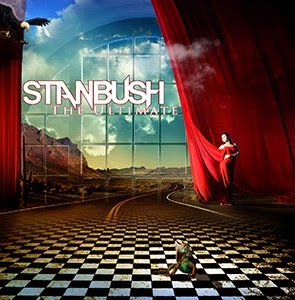 A big title to live up to and while I don't think it's necessarily "the ultimate Stan Bush album", it's certainly very good. Sure it's AOR by numbers, but I happen to like these numbers! Most of the songs have a very strong "80'ies Action Movie Soundtrack"-vibe, the lyrics are uplifting and empowering and the choruses are the kind of stuff that one will HAVE to sing with fists clenched. In addition to the power rockers, of course Stan throws in a few of his trademark ballads. Once again Stan has decided to include yet another version of his most well-known track "The Touch" on this album. Frankly, I could've done without "The Power Mix", it really doesn't add any power to the track. It does sound more contemporary but it's also more repetitive and duller than the original. Well, if it helps selling a few more copies of this album then I guess its' inclusion is justified.